RotaTrim MasterCut trimmers (also known as MonoRail cutters) offer professional grade trimming and cutting at an affordable lower cost price. Built by craftsmen by hand, using quality materials, these cutters will perform with precision and accuracy and will cut material between 1.5 mm and 2.0 mm depending on the model. All models allow for two-way cutting (in either direction) and use the finest quality steel for their self sharpening blades. Ideal for regular trimming of classroom and office materials. One-way cut with overload protection feature. Finest quality Sheffield Steel self-sharpening precision blades. Single square chrome steel guide rail eliminates head swivel. Transparent clamp-strip for accurate work placement. Solid laminate gridded baseboard with aluminum side rule and cursor. The RotaTrim MasterCut (Monorail) models are designed for use in all kinds of projects, including: home (arts & crafts), office/business, photographic studios, print shops, classrooms, and more! The MasterCut MCA4 RotaTrim 13.75" trimmer is a lightweight and portable table or desktop trimmer designed for general day to day use. The smallest in the MasterCut MonoRail series trimmers is large enough to handle most 13.75" (350 mm) width material, including: paper, photos, letter, card stock, craft paper, laminated materials, etc. - up to 2.0 mm in thickness. 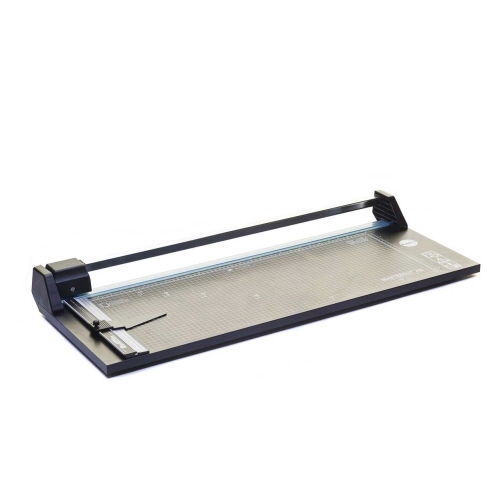 The MasterCut MCA3 RotaTrim 19" trimmer medium format table or desktop model for general art and print shop use. 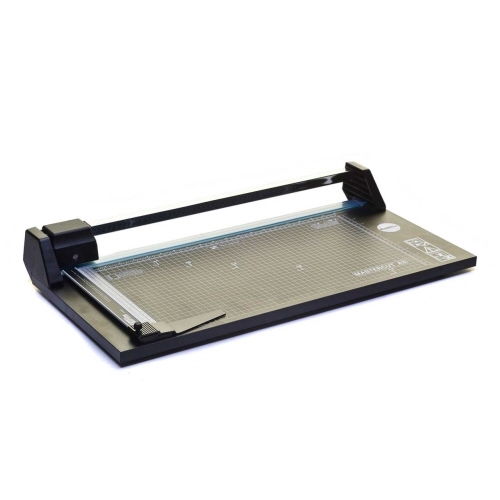 This RotaTrim MasterCut series trimmer is large enough to handle medium format 19" (480 mm) width material, including: tabloid paper, photos, letter and legal sheets, card stock, craft paper, wrapping paper, etc. - up to 2.0 mm in thickness. The MasterCut MCA2 RotaTrim is a 26 3/4" rotary trimmer designed for larger paper and other media printed or non-printed material. This RotaTrim Monorail MasterCut series trimmer is designed to accommodate wider width material up to 2.0 mm thickness. 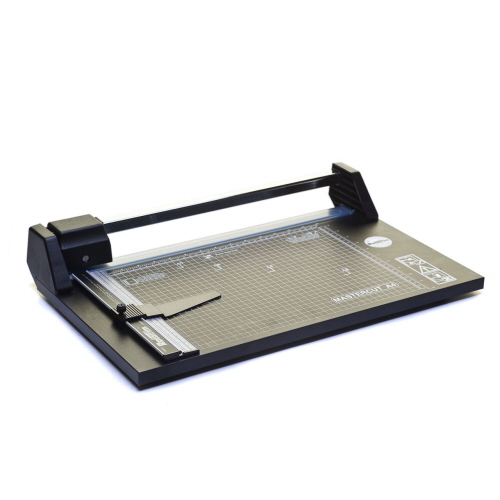 It is ideal for general purpose cutting use in classrooms, print shops and offices alike. The RotaTrim MCA1 MasterCut wide format trimmer is 37" model with extended reach for precision cutting of larger media materials. 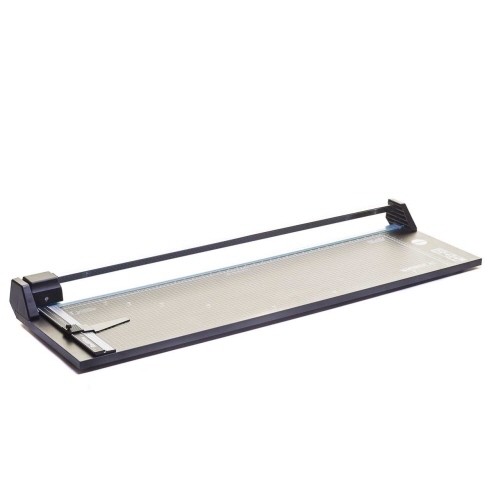 This MonoRail MasterCut model includes all the same great features, including: quality steel rotary blade, chrome steel square cut bar, and transparent paper clamp strip to hold material in place while working.